We have already talked about how your different needs as a bushcrafter, prepper, survivalist or general outdoors person dictate what kind of knife, or knives, you should look for. A survivalist, for example, looks for a single general-purpose knife that is decent at everything, but expert at none, while bushcrafters and preppers, should look for more specialized tools that are designed for specific uses. There is also a cultural aspect to this. In the USA batoning firewood is a fairly common, although hotly debated, practice, while in most other parts of the world, that practice is fairly unusual, instead using an axe for splitting logs. Likewise, really big knives like machetes are very common in places with a need for clearing brush, but not as common in e.g. Scandinavia. In a military context however, such types of knives have been in use even here, going back as far as can be remembered. Today, we are going to look at two knives from the same maker, Terävä, which fill specialized functions at opposite ends. 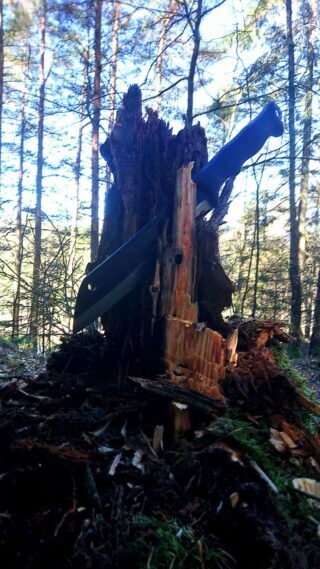 One is a distinct chopper, the other a more general use bushcraft knife. But as we shall see, the former blurs the line a bit with its design. As with our previous review, for those of you short on time, here is a quick review posted on YouTube. Remember to subscribe to the channel so you don’t miss out on the future reviews and tips & tricks that will be posted. And for those of you with a bit more time, here are more comprehensive reviews of the two knives, but first a brief presentation of the brand and the maker. Terävä, alongside of Särmä & Jämä, is one of the sub-brands of Varusteleka and means “sharp” in Finnish. 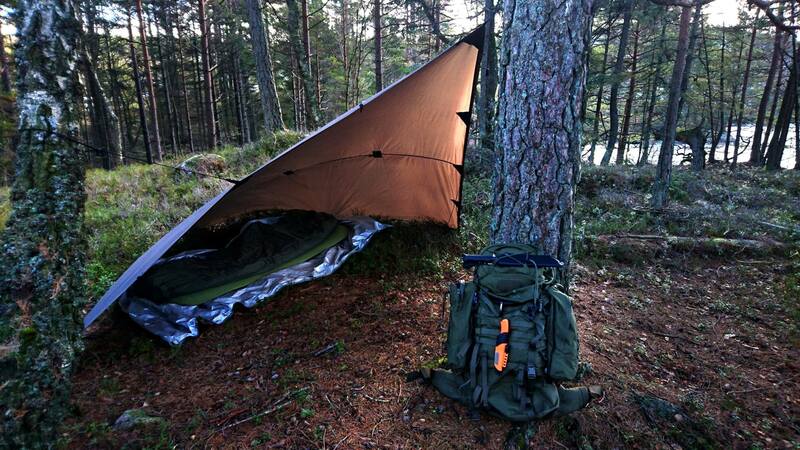 Varusteleka is a reputable and a growingly popular Finnish store that focuses on both military surplus and new production of clothing and items relating to outdoors life, hunting and military. They are renowned for their great, no-nonsense attitude, combined with a fantastic sense of humour. They are also the only known retailer offering Swedish commando underwear, of which I am a happy owner. 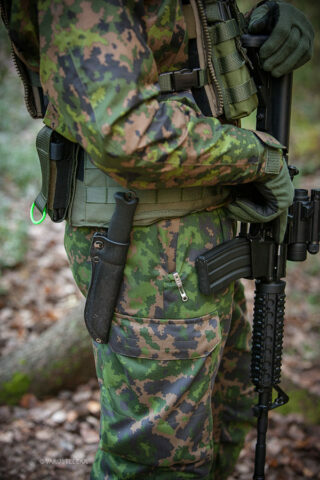 The various sub brands of Varusteleka all share the same goal: To offer affordable but quite satisfactory quality products that compete with high-end brands, aiming for the mid-range market, but with most products meeting the requirements of Finnish military specifications and even produced by Finnish military manufacturers, e.g. the Finn-Savotta factory in Estonia. Having followed them for a few years, they are always working at improving their own products, even presenting upgraded versions every year for some of their gear. Quite obviously they are very dedicated to what they do, which as a customer, is fantastic to see. We already reviewed the brilliant Peltonen Sissipuukko which Varusteleka has offered in their shop, albeit somewhat irregularly due to high requests and small production from the maker. This eventually led Varusteleka to create their own knife aiming at the same users, and thus their Jääkäripuukko was presented. Alongside of it, a larger and fairly uniquely designed “leuku” (big knife) named “Skrama” was presented. A long, gently formed handle that would give great hitting power for long swings, this would be the knives primary function. As a secondary function I wanted the handle to also offer a good grip for detailed work. Simple and strong construction, full tang and moulded rubber grip. After a few drawing we got to work with Laurin Metalli, one of the biggest named in the Finnish puukko and blade industry [the same blade manufacturer as for the Peltonen Sissipuukko]. Their expertise and experience made for a great collaboration, one of the best jobs for me so far! Really quick the prototypes turned into this, the final product, which is even better than I had dreamt! But enough talk about the maker. You are here for the knives. Grip: Moulded rubber, rough texture for a good grip. 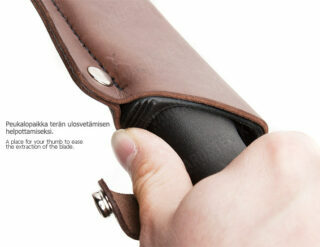 Weight (without sheath): 525 g.
The leather is 2mm thick vegetable tanned cowhide, strong and sturdy. All attachments are made with numerous strong studs. Snug fitting press stud strap secured the knife properly in its place. A grommet for a leg tie has been added to the tip. Inside the leather sits the standard sturdy Skrama plastic sheath, a thumb knob on the side of the mouth makes unsheathing easy and controlled. The design is based off of a historical, Nordic “broken-back” scramaseax design, most commonly used in the north of the British Isles, but also elsewhere. 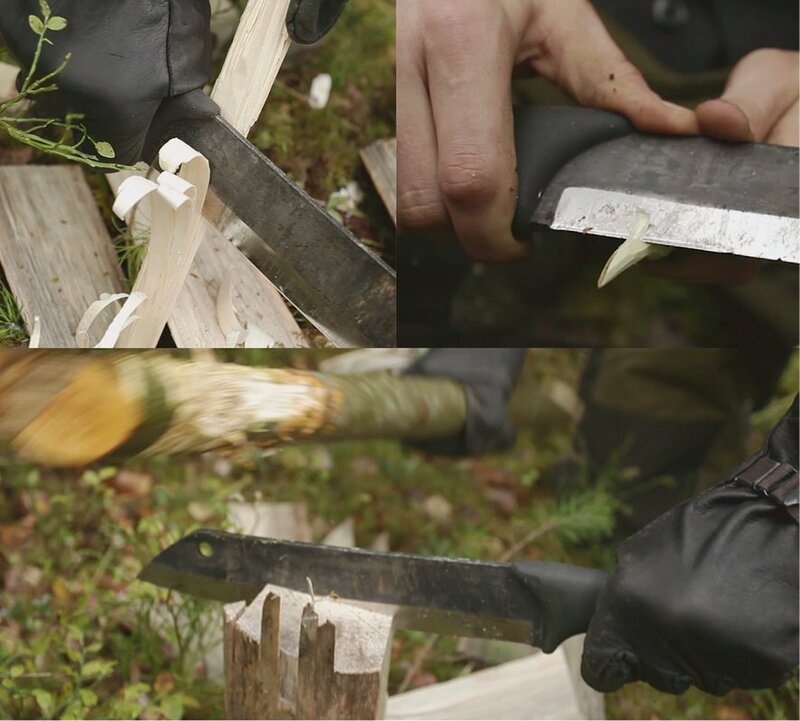 The Terävä Skrama is designed to replace an axe, and is far more dynamic and offers a lot better control than an axe does. The long edge is a lot more forgiving than a short-edged axe is, meaning you don’t have to cut as precisely, which is good especially for outdoors use, while perhaps not as important at home at your farm, when chopping logs. 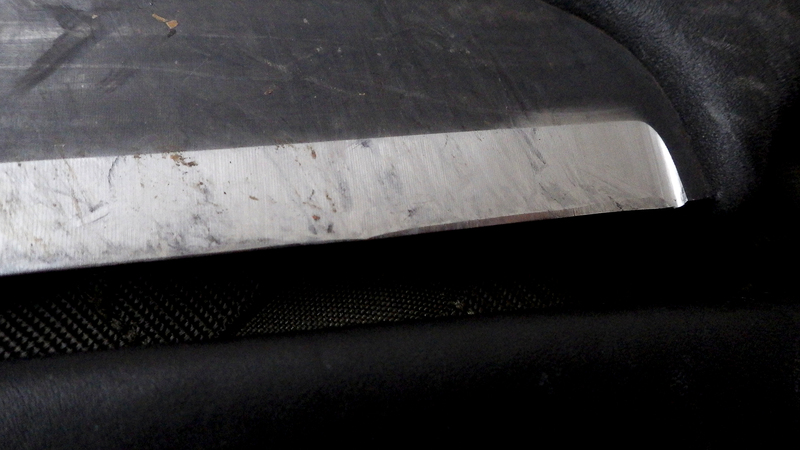 Speaking of which, as expected, the Terävä Skrama is a fantastic chopper, but also a surprisingly good carving knife. This is due to the long, slightly curved edge which has been differentially sharpened, and designed in such a way that about a 3 fingers’ width near the grip is sharpened at 25°, similar to smaller Scandinavian knives, giving a sharp, carving edge. The rest of the blade, however, is sharpened at 32°, which gives a less keen, but more durable edge, designed for heavy chopping. Having tried this quite a bit I can comfortable say that it works surprisingly well, even if the sharpening is a bit trickier due to this. The Terävä Skrama can quite comfortably chop pine branches about 5cm / 2in thick in a single cut, even at straight angle. At the same time, carving feather sticks, carving pointed sticks & pegs, and doing whittling works quite well, even if more detailed work might require a more proper carving knife. The grip also deserves a special mentioning. The tang is completely covered, which is good for cold winter use as subzero temperatures, cold steel and exposed skin is a bad combination. Consequently, this has been a standard in Scandinavia for a long time indeed and it is good to see that this practice is respected. The grip is unusally long and shaped in such a way that you basically get two grips in one; one grip near the blade, intended for fine carving, and one near the back end, intended for heavy chopping. This works very well and is actually quite impressive. Combined with the fairly unique differentially sharpened blade you pretty much get two knives in one, making it easy to both chop firewood and make kindling with it. The blade comes in both carbon and stainless versions, which is fantastic. Here, I have only tried the carbon steel versions of both knives though, so all data and experience presented here refers to that. 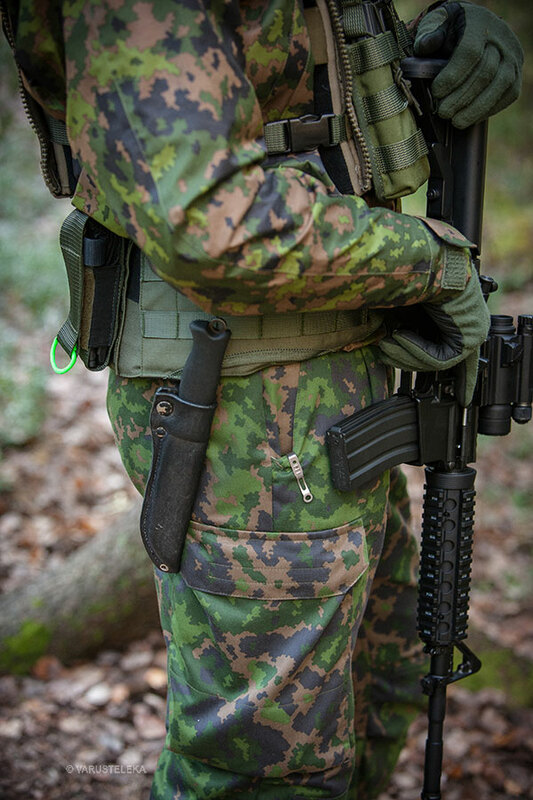 Sheaths come in both MOLLE and in leather versions, both with the same plastic insert protecting the outer layer of the sheath. So regardless of whether you prefer a more traditional style, or wish to attach it to your pack or harness, you can just choose what suits your desires. Similarly to the Peltonen Sissipuukko, the sheath has a small protrusion at the mouth that you use by pressing your thumb against when removing the knife from the sheath. This is a simple but great feature that makes it a whole lot easier to pull the knife with one hand. 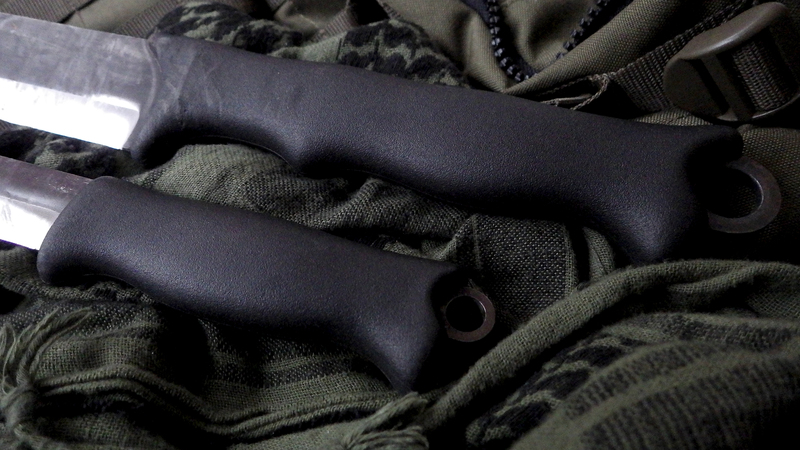 So, while a fairly simple design, the sheaths are really quite good. Sticking to simplicity is often wise, but a surprising number of manufacturers somehow manage to botch their sheaths up completely. Personally, and depending on what pack I am using, I carry it either in or inside of the side pockets of my backpack, or sometimes inside of the pack. This works since I mostly use it for chopping and have a smaller all-purpose knife hanging around my neck or from the chest D-rings on my Leo Köhler smock. So, summing it up, this is a fantastic and quite uniquely designed knife that is highly recommended for those of you looking for a very versatile and dynamic knife that can replace an axe and which works both for bushcrafters, survivalists and outdoors people in general. It is at least as powerful as a hatchet or small axe, but a lot easier to use since your cuts do not have to be as precise. And the blade and grip designs means you can use it also for less heavy camp chores, like working with tinder & food. It is quite remarkable and a whole lot of fun to use. In one word: Awesome. So, being so excited about the Terävä Skrama, what is the Terävä Jääkäripuukko like? Let’s find out. 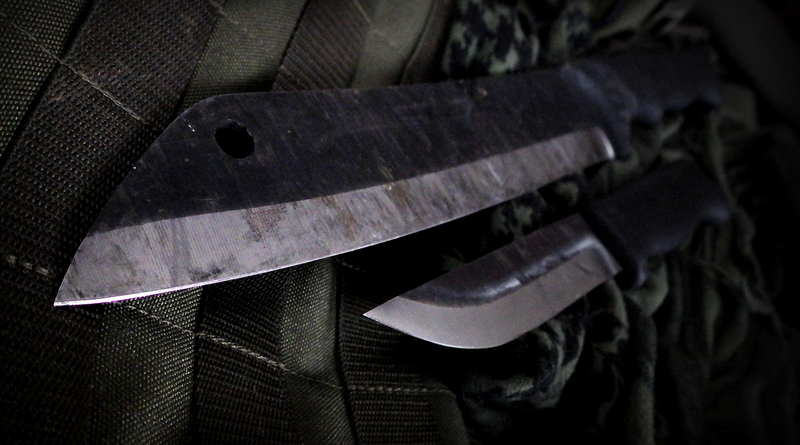 The Jääkäripuukko shares many of the same basic features of the Skrama, but of course with some differences. It comes in two versions, one with a 110mm blade, and one with a 140mm blade. 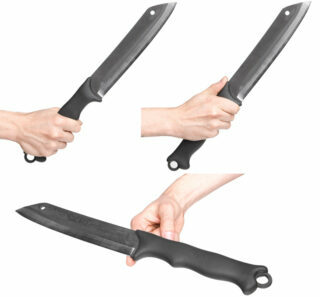 Blade length: 110 mm, width 26 mm, thickness 4 mm. 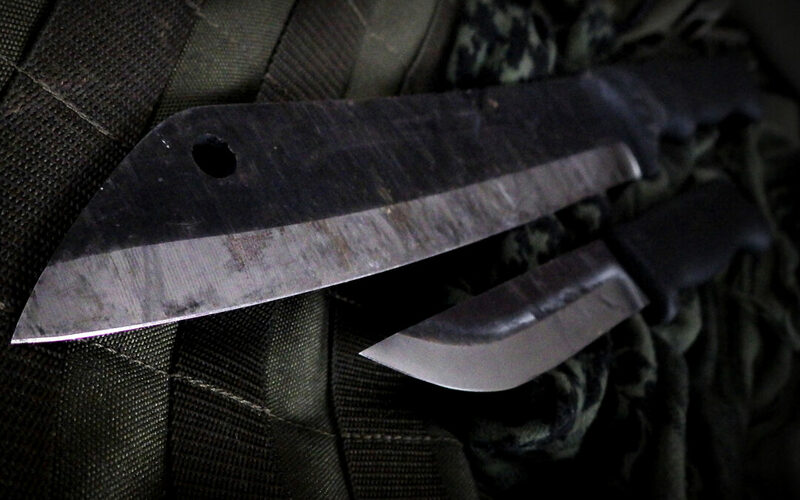 Edge angle: 23°, a very common puukko edge, great for all knifey tasks. Steel: Carbon steel 80CrV2, 59 HRC, or 4110 stainless steel hardened to 57 HRC. Handle: Direct molded rubber, textured for a good grip. Weight (w/o sheath): 175 g.
As already mentioned, this knife is aimed at people looking at an alternative for the hard-to-get Peltonen Sissipuukko and also competes with the recently launched Mora Garberg knife. Performance-wise it competes quite well with both, but is a fair bit cheaper than both. Again, like the Skrama, it has a double bevel grind, meaning it has a small, second bevel close to the edge. As such it doesn’t conform with the otherwise so common Scandi grinds with a single, large bevel. Personally, I would have preferred to see the Jääkäripuukko with the classical Scandi grind, as it is so easy to sharpen, but I can understand the reasoning behind their choice. Either way, it is a strong, resilient knife that is excellent at carving and has really good edge retention, so field sharpening will be a rare occurrence anyways. Like with the Skrama it comes in both carbon and stainless steel versions. The stainless steel version is naturally hardened a bit less, to 57 HRC, and will thus lose sharpness a bit quicker and easier. The Terävä Jääkäripuukko is not yet offered with a MOLLE sheath, only with leather or just the plastic insert for the DYI-people out there. The leather sheath of course has the plastic insert in it already. The knife feels very snug and safe in the sheath as it is, but the mouth of the sheath also has a press button for extra safety. I don’t really use it though as the knife is quite secure as it is. 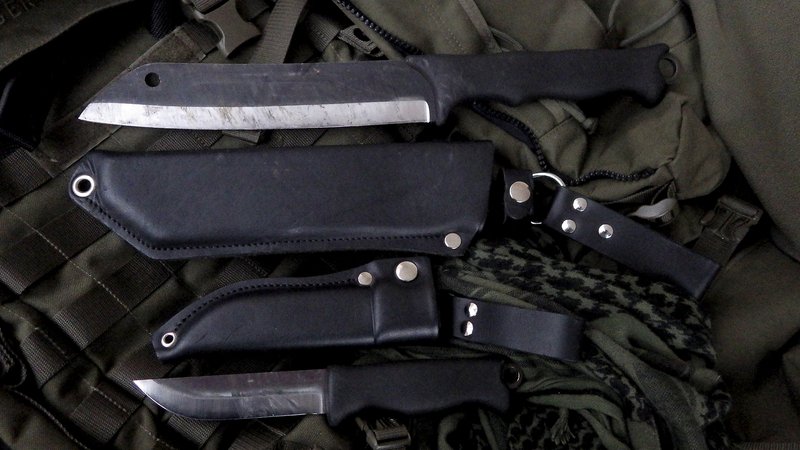 I do miss the thumb extension for unsheathing the knife that is on the Skrama sheath, though. Getting it out with one hand is a bit awkward, but as I keep it hanging from the chest it is not an issue for me personally. While the grip is a bit similar to that of the Skrama knife, with it’s slight belly, it is naturally shorter and quite comfortable regardless of whether you are holding it in regular, inverted or reversed grips. This too fits well with traditional Scandinavian grip design, which is good to see. While not as unique as the Skrama, the Jääkäripuukko is a more than adequate knife that is very easy to like. The quality in all details is very good, and while there are no details that really stick out, the overall simplicity is a great quality in itself, a quality that far too many makers manage to miss while searching for uniqueness. A few details I would personally like to see tweaked, like the grind and the lack of a thumb rest, but those are really very minor requests. May be worth considering it for the maker though. For a first time knife designer, Varusteleka has been remarkably successful with their unorthodox thinking and their ambition to offer great quality knives at quite affordable prices. The two basic knife designs they offer rival and sometimes even outcompete quite a few far more expensive knives and I gladly recommend both of them, although I have to confess the Skrama caught my heart a bit more. Can’t wait to get out and use it again.